Remember When The Nissan Pathfinder Wasn't The Mallfinder? Perhaps the Nissan Pathfinder’s uh, path towards civilized “Mallfinder” began in 1996 when it switched from body on frame to unibody construction. It was, however, still rear-wheel-drive based with optional 4WD. Today’s Pathfinder is a FWD sedan-based crossover with three rows of seats, hence its permanent Mallfinder status. It’s kind of a shame, really, considering the Pathfinder was once one of the better mid-size SUVs on the market, facing off directly against the old Ford Explorer and Chevrolet Blazer. But the Pathfinder had a devout following, nonetheless, and this Motor Week Retro Review will certainly bring back some great memories. For model year ’96, the new Pathfinder received not only that new platform, but also a new engine. Forget turbos or hybrid boost. This was the mid-90s, and gas was insanely cheap. A 3.3-liter V6 with 168 hp and 196 lb-ft of torque was standard, allowing for a 0-60 mph time of 11.5 seconds. Not fast, but the Pathfinder didn’t need to be because that’s not why people bought them. With the optional limited slip diff, the suspension had an independent strut setup allowing for real off-roading. But sadly, that’s all in the past. Try, if you dare, off-roading today’s Pathfinder. Nah, scratch that. Just take it to the mall where it belongs. Nissan has honed its recipe with the refreshed crossover. 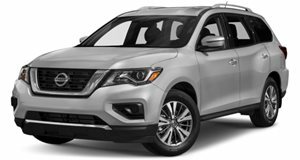 With a greater emphasis on comfort and practicality, this current generation of Nissan Pathfinder is a noticeable departure from its predecessors.